Handcrafted art nouveau woman with flowing hair floral pattern silver plated metal card case business card holder. Holds up to 15-20 standard sized business cards. Feminine business card case silver plated vintage inspired style metal card wallet neo Victorian Steampunk business card case NEW. 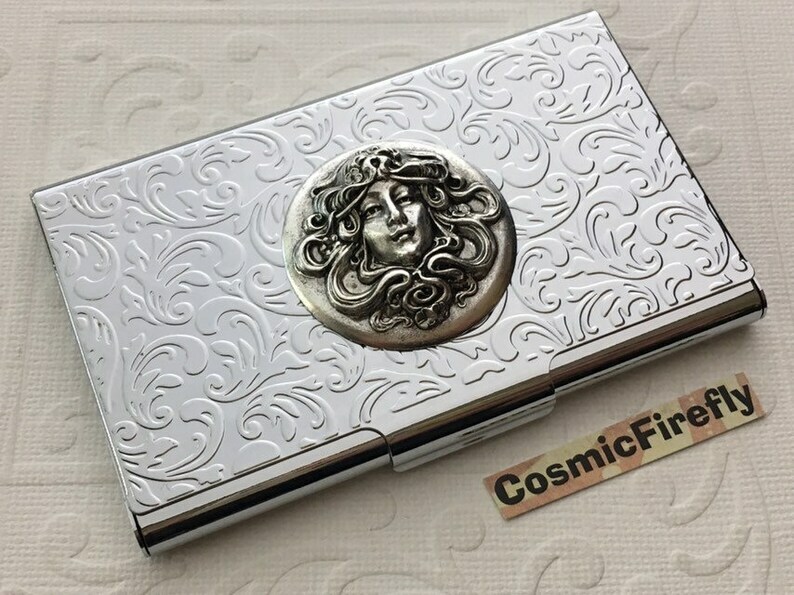 Slender compact size silver-plated metal business card case / credit card holder with raised art nouveau head of a woman with flowing Medusa hair design on the front cover. Here's an incredibly nice comment about one of our card cases that we recently received from one of our awesome customers: "Was most pleased with purchase. It is gorgeous and has many admirers. Please continue to astonish and amaze with your crafts!" Size of case is 3-5/8 inches long by 2-5/16 inches wide by a slender 5/16th of an inch thick, the case is thicker if you add in the thickness of the shape on top which is about another 1/4 of an inch thick. Engraved into front surface of the case is a Vintage European Art Nouveau floral design pattern. The raised embellishment on the front is a vintage design with incredible detail and an antiqued silver plated finish. The art nouveau shape is machine stamped from sheets of brass using the original die mold machinery from the 1930's-1950's. 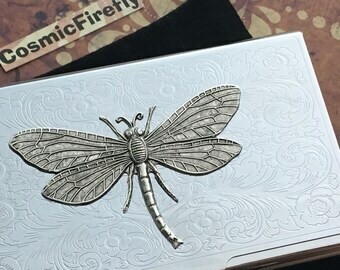 We have actually sold one of our cases to an extremely well known female Rock Star who buys unique accessories on Etsy and she totally LOVES it! Make the Ultimate Victorian Steampunk Fashion Accessory Statement and carry it in your bag wherever you go. We are proud to be in the Top 100 Jewelry & Accessories Stores on Etsy.